Last autumn we shared early results of testing various versions of the GOV.UK 'Thank You' page. First introduced a year ago, people see this page once they've bought their tax disc via GOV.UK. People are generally more open to trying out new stuff after completing a successful transaction, so we've been using this page to encourage as many as possible to join the NHS organ donation register. Via a comment on that earlier blog post, Claire reminded me recently that we'd not shared the final results of the experiment, notably which type of message was most effective at persuading people to register. Working with the Cabinet Office Behavioural Insights team, DVLA and NHS Organ Register team, we tested eight different calls to action with a total of over 1,000,000 visitors to the tax disc 'Thank You' page. The eight variants below appeared at random, and we worked closely with the NHS Organ Donation team to see which one generated the most completed registrations. This is known as A/B testing. 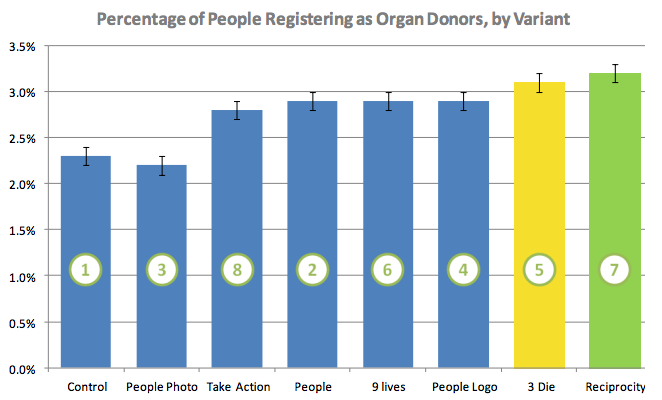 Here are the results, showing which variant was most effective at getting people to actually register for organ donation. The percentages are not just for click-throughs; they're actual organ donor registrations. I don't feel qualified to speculate as to the reasons why this particular message performs best - data trumps intuition. But, feel free to add your thoughts via the comments below. We ended the experiment in the autumn, and have left this "reciprocity" message in place. Meanwhile, the new digital team at DVLA has got on with updating the tax disc service. Since the DVLA tax disc online service is used by around 2m people every month, the impact of such optimisation is significant. Extrapolated over 12 months, some 96,000 more people will register compared with the original call to action. ("Please join the NHS Organ Donor Register"). In December the former Cabinet Office Behavioural Insights team published a paper with more statistical detail on the experiment. In total over 350,000 people have registered for organ donation via this one link on GOV.UK since we added the original call to action just over a year ago. Follow Tom on Twitter, join the wider conversation with @GDSTeam and don't forget to sign up for email alerts. Any initiative to increase organ donation should be praised. Well done! Over 350,000, this is awesome! Great test and a great contribution to the society. Very interesting article and what a great result. Cialidin also highlights the importance of "social proof" : we are likely to do the same things that other people do, when we identify them as being similar to us in some relevant respect. Since March 2013 over 350,000 people who came here to buy a tax disc have registed as organ doners. It is good to see that online marketing is doing some thing positive and contributing to the society. Good effort. Wow, so you got a conversion rate of 22% of all viewers of the thank you screen. That's pretty good! I wish that were true, but you can't add the percentages without dividing by 8. 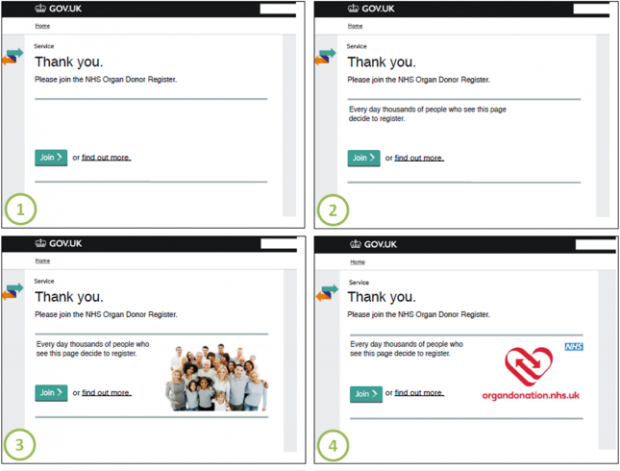 John: 3% of people who *saw this screen* went on to actually finish signing up for organ donation. It doesn't matter what path they took to get there. So to answer your second question, the variant with the most sign-ups *is* the one with the highest percentage of people who signed up. Thanks for the clariifcation. But that suggests that six of the variants had very similar success, I wonder if that means there's a limit to the conversion rate or if that there may be room for tweaking the design to get an even higher response. Also, I notice that variant three with the logo performed well, but you didn't test it with alternative wordings. Given it's such an important cause, might it be worth adding the logo to the successful wording variant and see if you get better results? Great initiative, but I'm confused by youer explanation. 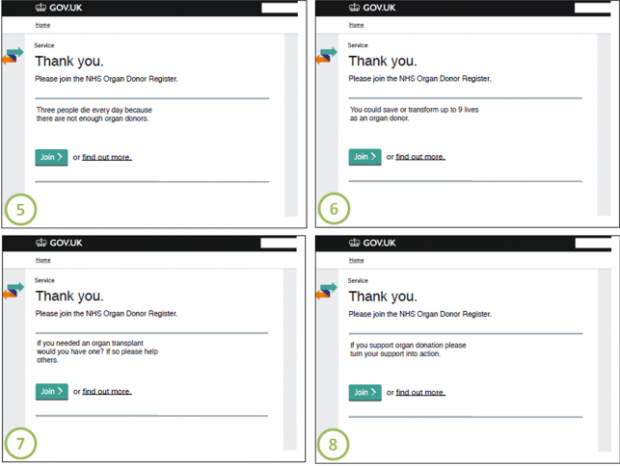 Option 7 was most successful because it achieved a sign-up rate of just over 3%. 3% of what? 3% of people who clicked through on that option or 3% of all click throughs? Isn't the most successful variant, simply the one that yields the most sign-ups rather than a percentage?